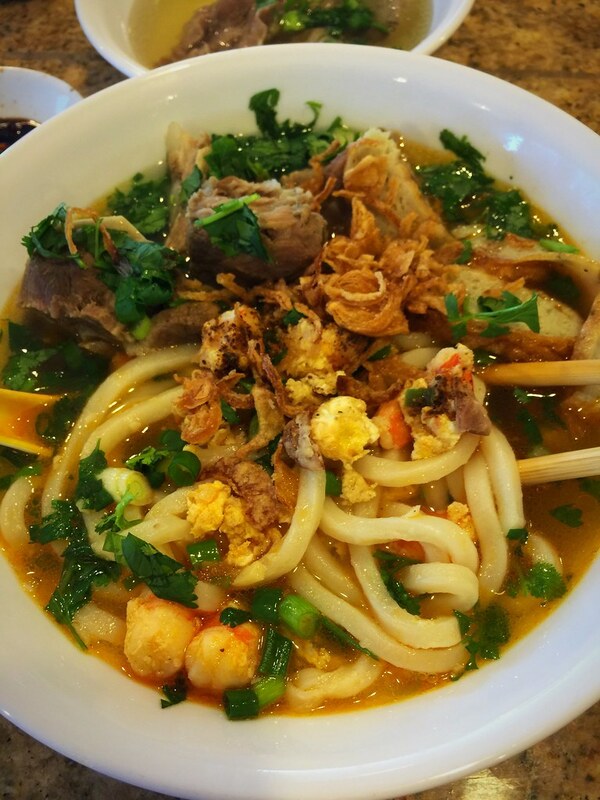 When you think of popular Vietnamese noodle soups, what’s the first thing that pop up in your head? Pho, right? Well, in Phu Quoc, my parents hometown in Vietnam, Banh Canh, a.k.a. Vietnamese Udon Noodle Soup, is king. This is what I remember seeing most people eat on a daily basis when I visited Phu Quoc back in 2006 AND this is also what my mother made pretty frequently for my family for as long as I can remember. The most important part of Banh Canh is the pork broth. Pork neck bones and pork spare ribs must be simmered for several hours to create a super flavorful broth. Once the pork broth is ready, you would fill a bowl with thick and chewy Vietnamese udon noodles (typically made of either tapioca or rice flour), top the noodles with boiled shrimp, thinly sliced fish cake, and tender pork bones (or any other available protein), ladle a big spoonful of boiling hot pork broth over the noodles, garnish the hot bowls with fresh chopped green onions and cilantro, and finally squeeze some lime juice over the noodle soup to brighten it all up. Delicious! Banh Canh is ultra flavorful and I guarantee you will enjoy all the different textures in every bite. There are many variations of Banh Canh, but this is how my family made it growing up and this is what I love. Personally, I’m not a big fan of the other Banh Canh variations served at Vietnamese restaurants, but I think it’s definitely a preference thing. Parboil Pork – Fill a large stock pot with water. Add pork spare ribs and neck bones in the stock pot and bring to a boil. After boiling for ten minutes, dump the pork spare ribs and neck bones into a clean sink and wash and scrub all the scum off the pieces. Make Broth- Fill a large stock pot with water. Gently add pork spare ribs, neck bones, onion, and daikon, fish sauce, rock sugar, and salt to the stock pot and bring to a boil. Lower heat and simmer on medium heat for 2 1/2 hours or until meat is tender. Make Shrimp Topping- Heat small/medium skillet on medium heat. When skillet is hot, add oil and garlic and stir garlic until lightly browned. Add shrimp and cook shrimp until pink. Stir in shrimp paste, sugar, salt, and black pepper and cook for a few minutes. Assemble Vietnamese Udon Noodle Soup Bowls – Add Udon noodles to bowl. Top with shrimp topping, green onions, fish cake, and pork. Pour boiling broth into the bowl. Top with fried shallots, cilantro, black pepper, and some lemon juice. Substitute 1-2 teaspoons of sugar for rock sugar. However, I think rock sugar gives it a distinct Vietnamese noodle soup taste. The ingredients I used in this recipe is what I’m used to making in my home, but you can certainly add crab, processed seafood balls, meatballs, and chicken as well. For the broth, you can always mix and match different type of pork bones for your personal preference. There are times I would just make it with just spare ribs so we can have more meat. There are different types of Udon Noodles you can find at the Asian grocery store. I prefer the Japanese Udon noodles over the Vietnamese Udon noodles. If you don’t like pork broth, use chicken broth.